Welcome to the capital of the second least densely populated country in the world. 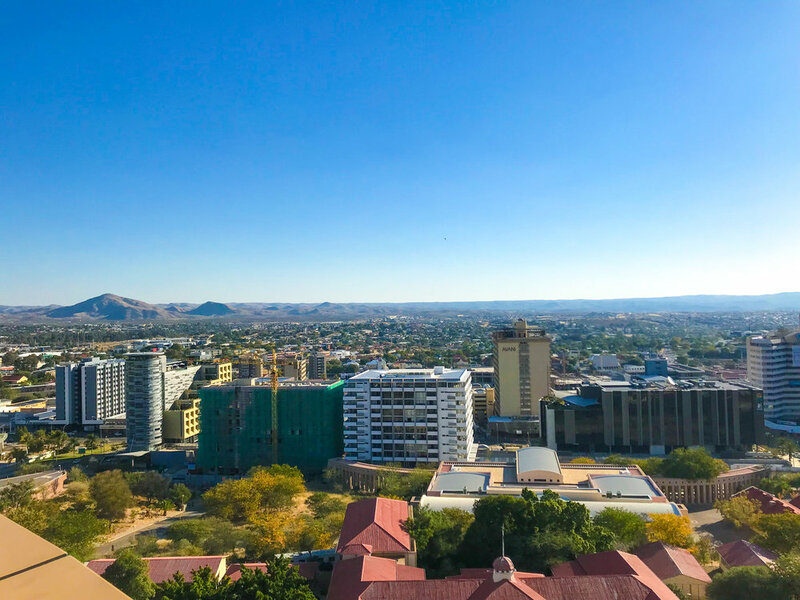 My stay in Windhoek consisted of four nights; the first not really counting because I arrived close late at night, and only went in search of a store to get something to eat after checking into my Airbnb, and went to bed. When you are planning your trip, I suggest only including 2-3 nights in Windhoek. The country has so much to offer outside of Windhoek; from Swakopmund, Walvis Bay, Fish River Canyon, Solitaire (all of which I’ll cover in later posts) and if you’re looking to climb some of the largest dunes in the world, hike or take a helicopter ride over the largest canyon in Africa, sand-board down some dunes, or relax by the ocean side, Namibia has you covered. 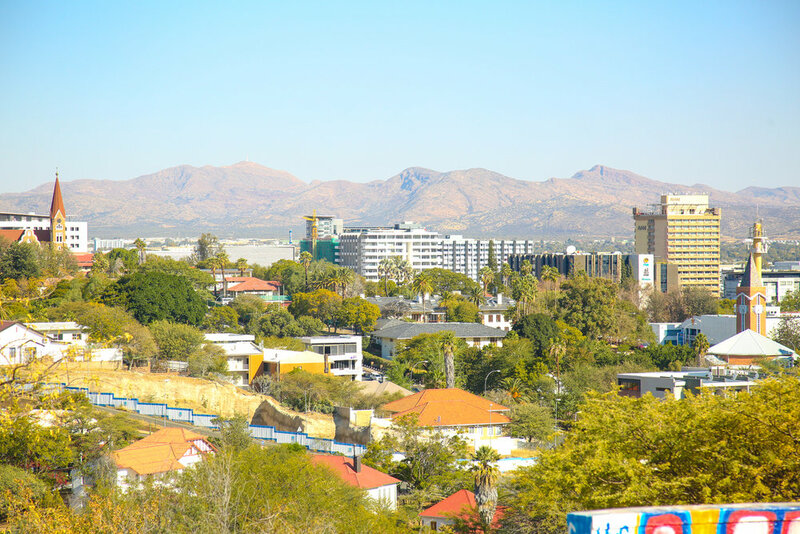 But first, what to do in Windhoek? Below is a compilation of some activities including visits to landmark sites, as well as places to eat and ways to enjoy what the city has to offer. You can do all of these in one weekend and at leisurely pace. Enjoy! Book your accommodation in the downtown area, on or around Independence Avenue and you won’t have any issues getting around. You can walk most places or take a taxi. There is currently NO Uber or other ride hailing apps in Namibia, so you’ll be making use of local taxis until you rent your car. I booked an apartment via Airbnb on Independence Avenue, that’s across from the Hilton Hotel and conveniently located near supermarkets, a mall and some restaurants. If you are like me and appreciate a good vantage point plus graffiti, I suggest you check out 3 Circles. It’s a short taxi from Independence Avenue and also within walking distance if you know exactly how to get there. I arrived here in the afternoon with Kevin, a creative and photographer that I had connected with on Instagram before arriving in Namibia. 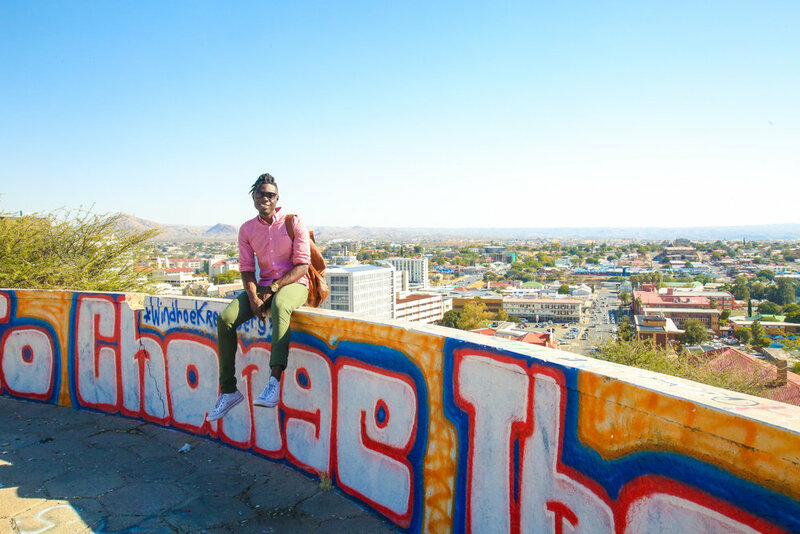 We were the only ones up there, and we used that to our advantage to admire the various graffiti, shoot some images, and soak in the sweeping elevated views of downtown Windhoek, all interrupted. The landscape you’ll see is a mix of mountains in the background, coupled with modern city buildings in the foreground. You can even make out some notable buildings like Christuskirche and the Independence Memorial Museum. I could even make out of the apartment building I was staying in! I’d recommend bringing a few ciders (Savanna or Hunter’s Dry) to enjoy with the view. Just remember to take the bottles with you. J Plan on 30-60mins at this location. From 3 Circles, you can head to down to Christuskirche. It’s a historic landmark that was built following the wars between the Germans, Nama and Herero. The church has a neo-Romanesque design, with Art Nouveau and Gothic revival influences. It also looks like the perfectly crafted gingerbread house! It’s worth spending a few minutes inside, plus it’s free to enter. Check out the video below for an inside look at the church. Across the street from Christuskirche is the Independence Memorial Museum. Also free to enter, you can learn more about this young nation and it’s fight for independence. It was a South African territory until 1990, and officially became a UN state in 1991 and is the second-to-last African country to gain independence. You’ll probably spend 30 minutes or so browsing through the halls. On the fourth floor of the museum you’ll find Nimms restaurant. Enjoy lunch, or drinks there, as well as the 360 views of Windhoek; they’re even more impressive views than the one offered from 3 Circles. Now of course you’ll need body fuel for your city explorations. As a vegetarian, I knew that my choices would be rather limited (this is Africa after all. I actually had to explain the difference between being vegetarian and vegan to one of Kevin’s friends’ and what things weren’t included in those diets. Quite the humourous conversation), so I made sure to grab a few grocery items for breakfast; makes figuring out what to have for brekkie that much easier. Now there are quite a few restaurants in the downtown/ Independence Avenue area, including the Sky Bar at the Hilton Hotel, which I recommend for great sunset views. Two establishments that I frequented regularly during my stay were Sicilia, offering Italian cuisine and a newly opened sushi restaurant, Sumi. I really enjoyed the pizza and pasta from Sicilia, which was located just two blocks from my apartment. They had a variety of vegetarian dishes, and most other items could be altered to your dietary needs. The staff was friendly and provided good customer service. Sumi is a refreshing space; light, airy and filled some of really nice paintings! The have good vegetarians rolls to choose from and I’m sure if you asked, they could make a different type of roll to suit your needs. Your typical sushi rolls and more are served here. For the nightlife scene, check out Chopsi’s and other nearby bars. Chopsi’s is the only one I went to and it’s a fun environment, varied crowd of mostly locals and some tourists and good music and drinks. Funny story to put in perspective how small the capital in terms of population size. While I was at the bar at Chopsi’s a woman tapped my shoulder and said hello. I gave her a blank stare, and she said, “Don’t you remember me?. I’m the agent who stamped your passport!” LOL! We laughed, clinked drinks and continued to enjoy the night. If you’re interested in free live music, while enjoying some delicious ice cream, I suggest going to Cramer. 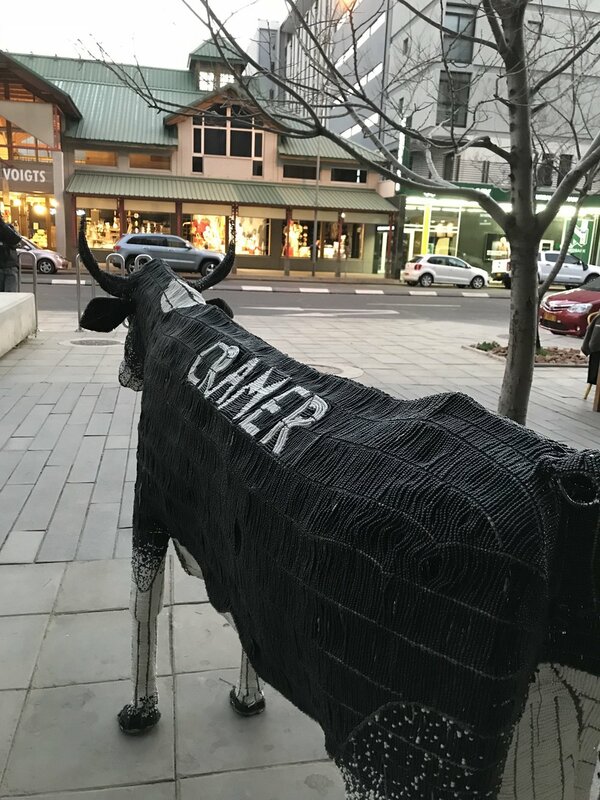 Also located on Independence Avenue, they serve a range of items from handmade ice cream, waffles, milkshakes to samosas and soup; and service wine, beer and other drinks. It’s a great place to get some fresh air and people watch. On Sunday’s from 2-5pm, there’s live music to be enjoyed. Feel free to share and comment below! Hopefully this comes in handy for your Namibia adventure! City views from Nimms Restaurant, atop the Independence Museum.